World-renowned physical chemist Naresh S. Dalal, the Dirac Professor of Chemistry and Biochemistry at Florida State University, has been selected as the 2012-2013 Robert O. Lawton Distinguished Professor. “This is a well-deserved honor for Dr. Dalal, who has been one of Florida State’s leading researchers for some time,” said President Eric J. Barron. “The Lawton Distinguished Professorship is the highest honor given by the Florida State faculty to one of its own, and I am most pleased that Dr. Dalal has been selected for this honor,” said Garnett S. Stokes, provost and executive vice president for Academic Affairs. Dalal, who researches the workings of molecular magnets, is the 10th member of the university’s chemistry and biochemistry faculty to be selected as a Lawton Professor in the past 50 years. “It is quite satisfying that Dr. Dalal’s selection as the 2012 Lawton Professor continues a fine tradition of cutting-edge research, outstanding teaching and commitment to serving the department and the university that exists in our department,” said Tim Logan, chairman of the Department of Chemistry and Biochemistry. Dalal uses powerful spectroscopy and computational methods to probe the intricate and detailed structures of metal compounds to understand their magnetic properties. “His research has generated great interest at both the basic and applied levels,” Logan said. In 1995, Florida State was looking for an academic star to enhance and raise the profile of its physical chemistry program. It found Dalal, West Virginia University’s Centennial Professor — that institution’s highest faculty distinction. “We interviewed a number of highly acclaimed scientists, and Naresh was the first choice of the search committee and also my first choice,” said John G. Dorsey, Florida State’s Katherine Blood Hoffman Professor, who was serving as department chairman at the time. After joining the faculty of Florida State’s Department of Chemistry and Biochemistry, Dalal initiated collaborations with scientists from regional universities and quickly began recruiting students from those schools. He was soon appointed as the department’s chair of graduate recruiting and the admissions committee. Dalal served as department chairman from 1999 to 2007. During that period, the department increased graduate student enrollment from 85 to 145 and increased its number of doctoral graduates from four or five per year to 15 to 20 per year. Dalal’s research interests are uncommonly broad, spanning the fields of free radicals in toxicology and carcinogenesis to ferroelectric, magnetic and multiferroic phase transitions in quantum solids, quantum dots, quantum computing and high-temperature superconductivity. “First and foremost, Naresh is a scientist in the general sense, transcending traditional boundaries of chemistry, physics and instrumentation,” said James S. Brooks, Florida State’s Grace and William Moulton Professor of Physics and director of National High Magnetic Field Laboratory’s program in experimental condensed matter sciences. “His contributions range from major advances in our detailed understanding of fundamental problems involving superconductivity and phase-transition phenomena all the way to new approaches to studying the free radical species responsible for certain diseases,” said Sir Harry Kroto, Nobel laureate and Florida State Francis Eppes Professor of Chemistry. Throughout his career at Florida State, Dalal has written 235 articles that were published in scholarly journals. Alan Marshall, one of the nine prior Lawton Professors from the Department of Chemistry and Biochemistry, said that Dalal has elevated the profiles of his Florida State colleagues by co-authoring refereed journal publications with an astounding 28 Florida State faculty members from Chemistry and Biochemistry, Physics and the National High Magnetic Field Laboratory. In 2003, Florida State named Dalal a distinguished research professor. 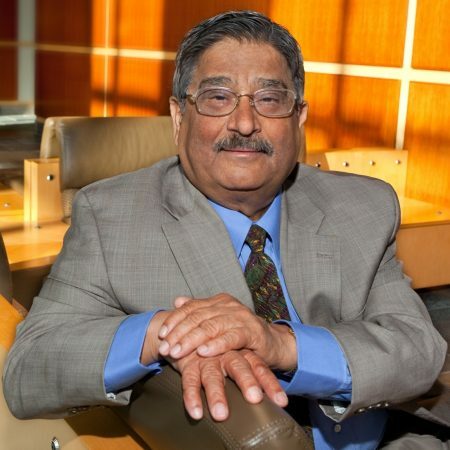 After his tenure as department chairman, Dalal served as assistant dean of the College of Arts and Sciences from 2007 to 2008. Dalal’s professional stature is evident in the honors he has received from some of the world’s most prestigious scientific bodies. In 1993, he was named a fellow of the American Association for the Advancement of Science. In 2000, he was named a fellow of the American Physical Society. The American Chemical Society honored Dalal with the Florida Chemist Award and the Southern Chemist Award, both in 2007, and named elevated him to the rank of fellow in 2010. That same year, Dalal received the International Electron Paramagnetic Resonance Society’s Silver Medal for Physics/Materials Science. Dalal earned his doctorate in physical chemistry from the University of British Columbia in 1984. The Lawton Distinguished Professor Awardwas first presented in 1957. The award was known as the Distinguished Professor award until 1981 when it was re-named in honor of the late Vice President for Academic Affairs Robert O. Lawton. At that time past recipients also were designated Lawton Distinguished Professors.